This site uses Flash. If you can't see the flash content and have Adobe installed you may have to enable it in your browser. To enable flash content on Chrome look just left of the web address in the browser. Click on symbol then mark flash to Allow. To enable flash on Firefox go to settings then add-ons then for Shockwave Flash select always on. To enable flash in Internet Explorer click on tools in the top right of the browser, it turns blue on a mouse over, then go to manage add-ons and enable shockwave flash. To enable flash in Microsoft Edge look for located just to the left of the web address in browser, then click on it and turn Adobe flash on. Adobe Flash is built into edge so you do not have to download and install it. The browser may have to be refreshed for the flash to function. 1. To join panels securely together in such a manner that dimensional changes in the material or structure would not rupture or loosen the joints. 2. To achieve this objective with a fast and simple method of assembly, preferably without the need for tools. 3. To end up with a joint in which the fasteners are totally concealed. The Mod-eez Fastening system meets these objectives by utilizing a spring steel declining ramp “Clip” and a large collared “Shoulder Screw” as the two mating members. Spring steel makes the joints strong, yet flexible, while the collar on the Shoulder Screw adds tremendous resistance to torsional pull-out. 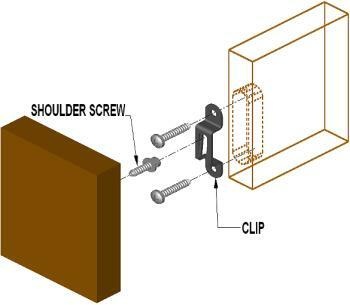 Assembly occurs by simply sliding the Shoulder Screw head down the Clip’s ramp. With the Clip located in its pocket, and the system assembled, all fasteners disappear! The Mod-eez® Fastening System Is A Premium Grade Joinery. The Mod-eez® Fastening System can be used in many different applications, such as cabinets, chairs and store fixtures. To view some of these applications, click on the Applications button above. If you would like to translate this web page. or any other page on this site just copy the URL link from your browser then CLICK HERE then paste the URL into the space for web pages (make sure you do not have two http://) select the language you want to translate to from English. That is all there is to it. We use Adobe® flash movies on this website. If you do not have a flash player you can download one for free. Click Here. This site is best viewed in Internet Explorer, other browsers may distort the size of the flash movies. We have several videos of product assembly using the Mod-eez® Flexible fastening System. Use the links found under the application pages to view them.